Try Continuous Ink System with your Epson Expression Home XP-4050 and make 30 times more quality prints for the same money! Pay only 0.04 USD for A-4 full color print! System CIS is one of the most called-for types of original materials. More and more often users give their preference precisely to the consumables, convincing that they are really more practical than the original consumables. By the way, you can equip any printer with the system after ordering it on our site, for example CISS for Epson WF-3530DTWF. 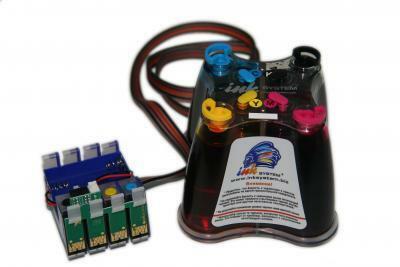 CISS for the printer of this model is a simple system of eight refilled donor tanks where the ink is situated, a flexible silicone tube and printing cartridges which with their features are similar to the standard consumables. This well-known system with a multifunctional device is a reliable model for printing images with maximum economy of ink. Simplicity in use considerably makes your work easier. Clear reproduction of copies and brightness of colors are guaranteed. Bulk ink system for Epson XP-405 - economy that does not exquire any evidences! As a result of perfect high quality materials, of which this system is made, it will serve you for a long time. Working with a printing device, equipped with ink system for Epson XP-405, you will not need to spend great amounts of money on plastic tanks, acquiring the ink only. Consequently, you can reduce expenses having reduced cost of each copy approximately 30 times. Of no small importance is the fact that the system CIS in addition allows considerably to increase the work efficiency. The system donor tanks, in particular CISS for Epson XP-305, 15 times are more capacious than the original cartridges. That's why you can much rare refill the system and print more than 2500 copies with one refilling. cis Epson XP-405 is comfortable, profitable and safely.